Not matter what industry you work in, stock is valuable, so you need a secure storage solution that will keep it safe and protected from risks such as theft and fire. The team here at Stodec Products can provide a range of secure and fire rated storage systems that will do just that. Designed around your business requirements, whether you need fire resistant document archives or chemical stores, or secured, enclosed pallet racking ideal for electronics or automotive storage. We can provide a full site survey, discussing your requirements for operations, budget and security and design a bespoke system that will meet all your needs. Our wide product range and expert installations team will help to bring your project in on time to deliver a secure and protected solution. Fire rated cladding can be applied to upright columns, beams and support steel on our mezzanine installations. We can install fire rated partitions and ceilings to enclose stock or racking areas as well as to provide separation for offices and fire escape routes. Our catalogue in the “Downloads” section includes fire cabinets and cupboard units for flammable products which include a sump unit to prevent volatile liquids from spreading. 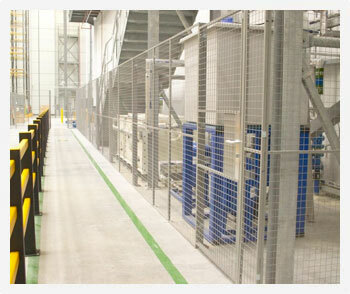 Security areas can be enclosed with our mesh or steel partition systems and these can be enhanced with structural components to increase protection. Please contact us for discussions on the best way to protect or secure your products.